Terry Myers is a leading trainer, teacher and national clinician, but above all he is a true horseman. Myers has trained stock and hunter horses for state, national and world competition. But he doesn't just train the show horse. His training is for all horses regardless of the discipline. He incorporates work with both horse and rider to achieve balanced movements. His Ride-in-Sync® philosophy helps riders understand how body position affects horse performance. Through Myers’ 45 years of experience and work with thousands of horses and riders, he has developed coaching and demonstration methods which provides logical information that is easily understood and put to use. Consistent feedback from clinic attendees is confirmation that Terry’s training ideology and teaching style produces results. 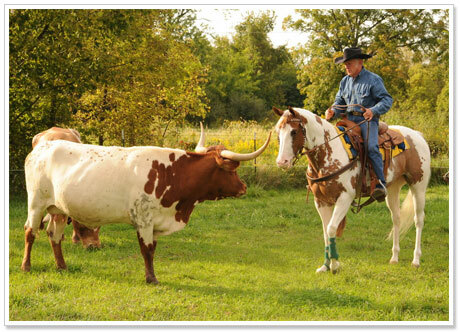 Terry is available for training sessions, clinics, horse training and interviews. Terry has hosted demonstrations and clinics in horsemanship, showmanship, trail, ground work and body positioning at Equine Affaire in Ohio and Massachusetts, Equus America Texas, Equus America Missouri, Equitana USA, Illinois Horse Fair, Michiana Horse Expo, Can Am Horse Expos in Ontario, Nova Scotia and New Brunswick in Canada. Terry has conducted training clinics in horsemanship, showmanship, trail, ground work and body positioning at the Terry Myers Training Center and at facilities across the United States and Canada. He is proud to have conducted several clinics with the cadets and army mules at the US Military Academy at West Point. See the schedule page for the current listing of upcoming clinics or contact us about hosting a clinic at your facility. Terry has also had articles published in Horse & Rider and Western Horseman as well as online on EquiSearch.com, an online magazine. Read his monthly columns published in the Horseman’s Corral and Horse Circuit News. Terry was formerly the Intercollegiate Horse Show Association coach for the Ohio Wesleyan University Equestrian Team for nearly 14 years. With the philosophy that a clinician needs to be able to prove that their skills can produce results…Terry has had years of success in training and showing Quarter horses and Paint horses. Myers trained his Paint Stallion, Reckless Obsession, to achieve American Paint Horse Association Champion status, as well as titles as Superior Halter Horse, Superior Trail Horse, and Superior Western Pleasure Horse. Terry has coached countless riders to achieve show ring success. 4-H: Terry is very involved with the 4-H youth in Ohio. He continues to sit on the Ohio State 4-H board, judges 4-H and open shows as well as conducts 4-H clinics. Built on years of proven experience, it is Terry Myers’ great pleasure to share his knowledge with horse enthusiasts around the county.